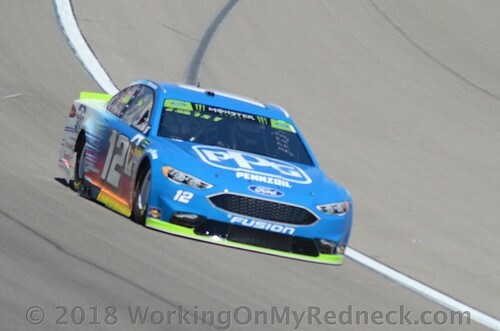 Can Blaney Punch His Ticket At Phoenix? Well, this Sunday we will be getting the 2018 seasons white flag at Phoenix. The Phoenix race is always a very exciting one to watch on TV, and even more fun to watch in person! It looks like Ol Chiefy, The Buschwacker, and possibly A&M Aggie Sue will be in the grandstands to watch this race. Additionally, Your Most Humble Sheriff will be roaming the media center, the garage area, pit road, and around the catchfence, looking to bring some good photo ops from ISM Raceway to The Redneck Fantasy League, and of course, Working On My Redneck. As the above photo suggests Ryan Blaney is the top voter-getter this week for Phoenix. There are four players, Edie The Las Vegas Super Star, A&M Aggie Sue, Linda B. The Cookie Mom, as well as Dan The Numbers Cruncher who are solidly behind Blaney this week. Even though he has had a very quiet season, Mr. Seven-Time, Jimmie Johnson, has recruited a very odd mixture of supporters this week. The three players who are rallying behind Ol JJ are Linda R. The Lemonade Lefty, Jerry The Buschwacker, as well as Amber The Extremely Lucky Cheddar Head. Additionally, we have two drivers who will have two players riding shotgun with them as the green rag is waved at ISM Raceway. It appears that Ol Skid-Marc will be teaming with his older and much wiser uncle, Leon Your Most Humble Sheriff, in supporting “that Jones Boy”, Erik. Both are hoping that EJ can pull off an underdog victory this weekend in The Valley of The Sun. Rounding out our choices this week will conclude with Lonna The Quilt Angel and Carole, aka Rudy putting all their marbles into the marble sack of “Rocket Man” Ryan Newman. When the checkered flag falls late Sunday afternoon there will be two emotions that will prevail. For the four drivers who will proceed on to Homestead to challenge for the 2018 MENCS championship, their dreams will be one step closer to fulfillment. For the four drivers who will be eliminated from the championship fight, their dreams will come crashing down and will have to wait for another year to see them come to fruition. Eight drivers, two races, one championship, who will be the last man standing at Homestead?